Shabbat. Again. The Gentiles have a Sunday experience while the Jews try to remember each small application of the Law. Lest they forget, some of the more observant brethren demonstrate in the more religious quarters each Sabbath against those whose interpretation of the Law is a little loose. 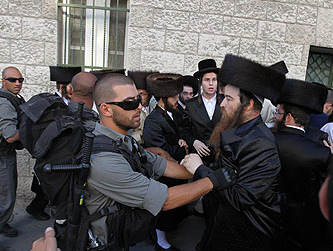 Last Saturday, a woman’s car was stopped in the street during one of the frequent protests by an ultra-Orthodox haredim sect. William Congreve’s observation about ‘scorned women’ was amply demonstrated. The girl, scandalously dressed, left her car, incandescent with rage and hurled colourful abuse at her male tormentors, so efficiently indeed that they scattered like lemmings to a man. But, they are few, even in Jerusalem. Glitz and worldly pleasure is a half-hour drive to Tel Aviv while here in Jerusalem, the elevators in most of the big hotels have a Shabbat setting, stopping at every floor, so the righteous have no need to press a button to activate an electric motor, which is, of course, against the Law since it falls under Torah’s definition of work. 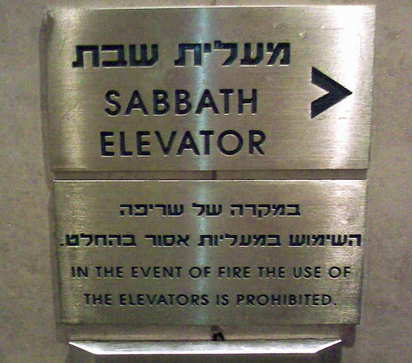 The image is from Jerusalem’s Crowne Plaza hotel where the elevator rises to the 21st floor without stopping then descends one floor at a time. Being in a hurry isn’t a good idea on Shabbat. It is sad that those who come here for a week still have a lot to say. When they have been here a month, they are less free with their opinions and after six months, rarely make comment. I am sometimes asked about what life is like here. These days I usually just remark “it’s complicated”. Complicated because societies are multilayered, sometimes defensive and sometimes not. It’s worth bearing in mind that almost all adults, men and women, have had military training, which brings an odd sense of comfort. There is no sense of beleaguerment, a sense of a society about to be attacked, but vigilance is unceasing, almost military. The school has underground bunkers. Where other schools practise fire drill, or even earthquake drill, we have in addition ‘intruder drill’ and air raid drill as well. 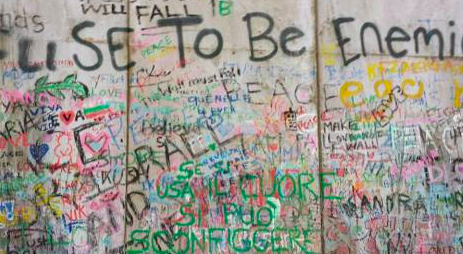 The only time I ever feel less than comfortable is when travelling through East Jerusalem or the West Bank. Perhaps I imagine smouldering rage where there really is none, the inhabitants are happier with their situation than I might imagine, piles of garbage notwithstanding. Many organisations bringing culture and music here are openly pro-Palestinian, some indeed behave as if the 1967 borders have already been ceded to the PA. A beautiful choir performed ‘Messiah’ in St Anne’s Basilica over Christmas, advertising previous concerts in Ramallah and even Gaza, and referring to their current location as ‘al-Quds’ rather than Jerusalem. We witnessed the end of an era yesterday. Once the darling of the Far Right, the towering presence of Ariel Sharon departed this life yesterday after many years in a coma. He did a political about-turn, supervising the Gaza pullout in 2005, thereafter attempting to shape the political landscape in his own image. I wondered what he would have made of the consequences, the rise of Hamas, negotiations with successive and increasingly more ambitious American politicians within a society increasingly secularised and impatient for peace and safety, some might say at almost any cost. There, now. I’ve said too much. After all, what do I know and why should my opinion matter more than an American or French commentator? One who has never left the familiarity of Washington or Paris, relying instead on a well-lubricated and Machiavellian propaganda of victimhood? Or the council of St James Church in London who have erected a replica wall at a cost of several thousand pounds to show solidarity with the Palestinian struggle upon which people can write messages of support or condemnation of the existence of the real thing whose protective umbrella saves lives. The Church’s avowed even-handedness is tarnished in their literature by their propositional use of words like ‘occupied territories’. Now I really have said too much.